Tell Tale Heart - A Crowd Pleaser!! Yowza! I said I would blog more and well... that just hasn't happened. I am making it my new years resolution to blog more. Here is the first of I hope many more posts to come! In October we read the Tell-Tale Heart. This story itself is a total crowd pleaser, but I think the activities we did with it made it even more enjoyable to my students. Luckily it is found in our literature book, which saved me a ton of copies, but I could also have to students listen to it as we read. (I LOVE the voices and pacing in the audio included with the book.) As the students were following along an listening to the audio, I randomly would stop and discuss parts with them. Some of them would look up at me in shock, like-I can't believe we can read about someone chopping up another person, which made it even more enjoyable to me. When finished reading, the students made a characterization foldable over the "insane" man/killer. The outside was an illustration of the "insane" man/killer and the title of the story. The picture is what I had on the board for them to do on the inside. The students did a complete indirect characterization of the character. I got the acronym STEAL from Darlene Anne's characterization packet (here). It has done amazing things for my 8th graders and really made them dig deeper to evaluate a character. They referenced their notes on types of characters that I got from Lovin' Lit's (Erin Cobb) reading notebook (here). I had some amazing final products, but forgot to take pictures. We also watched this cartoon version of The Tell Tale Heart on YouTube. My students LOVED this video! These task cards are amazing!! I highly recommend heading over to Tori's story to check out everything she has. To culminate our study, I split my students into pairs to complete task cards over the short story. (These were hands down the best resource I found for this short story) Not even going to lie, but since it was so close to Halloween & the other ELA teacher would be putting hers out in the hall, I told each class that the top 2 from each period would get a full size candy bar of their choice. It's amazing what an 8th grader will do for candy. 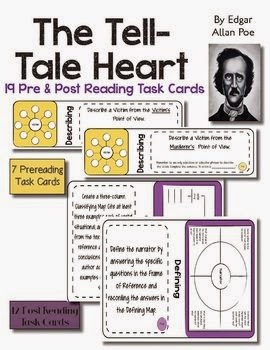 Let me know if you have any amazing activities you have your students complete when you read The Tell Tale Heart.... I am always looking for more to add!